The Birth of Pennsylvania depicts William Penn receiving Pennsylvania's royal charter from King Charles II of England. Penn founded the colony in 1681 as a refuge for Quakers. The History of Pennsylvania begins in 1681 when William Penn received a royal deed from King Charles II of England, although human activity in the region precedes that date. The area was home to the Lenape, Susquehannock, Iroquois, Erie, Shawnee, Arandiqiouia, and other American Indian tribes. Most of these tribes were driven off or reduced to remnants as a result of diseases, such as smallpox, that swept through long before any permanent colonists arrived. Pennsylvania was colonized by Swedish and Dutch settlers in the 17th century, before the English took control of the colony in 1667. In 1681, William Penn established a colony based on religious tolerance; it was settled by many Quakers along with its chief city Philadelphia, which was also the first planned city. In the mid-eighteenth century, the colony attracted many German and Scots-Irish immigrants. Pennsylvania played a central role in the American Revolution, and Philadelphia served as the nation's capital for a portion of the 18th century. It was the second most populous state in the country from the 18th century into the 20th century, and Philadelphia was the second most populous city in the nation. Pennsylvania also expanded its borders into northwestern, northeastern, and southwestern Pennsylvania, and Pittsburgh grew into one of America's largest and most prominent cities. The state played an important role in the Union's victory in the American Civil War. After the war, Pennsylvania grew into a Republican stronghold and a major manufacturing and transportation center. After the Great Depression and World War II, Pennsylvania moved towards the service industry and became a swing state. Lappawinsoe of the Lenape, painted by Gustavus Hesselius in 1735. The Lenape inhabited southeastern Pennsylvania. The best information we have detailing Pennsylvania's prehistory comes from a mix of oral history & archaeology, which pushes the known record back another 500 years, or so. Before the Iroquois pushed out from the St. Lawrence River region, PA appears to have been populated primarily by Algonquians  & Siouans. We know from archaeology that the Monongahela had a far more vast territory at the time  & the Iroquois Book of Rites shows that there were Siouans along Lake Erie's southern shores as well. The Iroquois collectively called them the Alligewi (better written Adegowe  ), or Mound Builders. It is said that this is where the term Allegheny comes from (Adegoweni). Two groups of migrating Iroquoians moved through the region—an Iroquois related group who spread west along the Great Lakes & a Tuscarora related group who followed the coast straight south. The Eries were the next to split off from the Iroquois & may have once held northwestern PA. An offshoot of them crossed the Ohio & fought back the ancient Monongahela, but later merged with the Susquahannocks to form a single, expanded territory. (Europeans later said that they used the terms White Minqua & Black Minqua to differentiate their ancestries from one another.) A whole other Iroquoian tribe, the Petun, are believed to be Huron related and entered the region after, wedging in between the Eries & Iroquois. By the time that European colonization of the Americas began, several Native American tribes inhabited the region. The Lenape spoke an Algonquian language, and inhabited an area known as the Lenapehoking, which was mostly made up of the state of New Jersey, but incorporated a lot of surrounding area, including eastern Pennsylvania. Their territory ended somewhere between the Delaware & Susquehanna rivers, within the state bounds. The Susquehannock spoke an Iroquoian language and held a region spanning from New York to West Virginia, that went from the area surrounding the Susquehanna River all the way to the Allegheny & Monongahela Rivers (about level with modern-day Pittsburgh). They were both affected by European disease and constant warfare with several neighbors and groups of Europeans, then began to be grossly outpaced financially as the Hurons & Iroquois blocked them from proceeding into Ohio during the Beaver Wars. As they lost numbers and land, they abandoned much of their western territory and moved closer to the Susquehanna River & the Iroquois & Mohawk to the north. Northwest of the Allegheny River was the Iroquoian Petun,  known mostly for their vast Tobacco plantations, although this is believed to be complete fabrication. They were fragmented into three groups during the Beaver Wars—the Petun of New York, the Wyandot of Ohio & the Tiontatecaga of the Kanawha River in southern West Virginia. (Their much grander than previously thought size evidenced by Kentatentonga being used on the Jean Louis Baptiste Franquelin map, a known name for Petun, showing them with PA bounds & with 19 villages destroyed & the use of Tiontatecaga, mimicking the Petun autonym, Tionontati)  South of the Alleghany River was, allegedly, a nation known as the Calicua (probably Kah-dee-kwuh), or Cali. They may have been the same as the Monongahela Culture & very little is known about them, except that they were probably a Siouan culture. Archaeological sites from this time in this region are scarce and the very few historical sources even mention them—most of these sources only coming from those who met Calicua traders further east on the Allegheny. 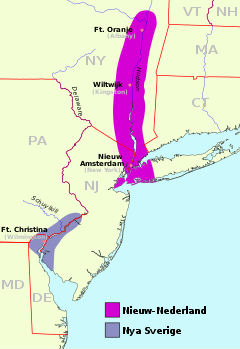 The locations of New Netherland (magenta) and New Sweden (blue) in the 17th century. New Sweden was later absorbed by New Netherland, before the latter was conquered by the English during the Second Anglo-Dutch War. Long-term European exploration of the Americas commenced after the 1492 expedition of Christopher Columbus, and the 1497 expedition of John Cabot is credited with discovering continental North America for Europeans. European exploration of the North America continued in the 16th century, and the area now known as Pennsylvania was mapped by the French and labeled L'arcadia, or "wooded coast", during Giovanni da Verrazzano's voyage in 1524. 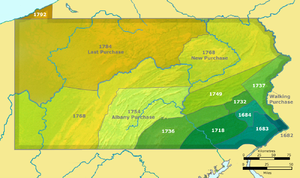 Even before large-scale European settlement, the Native American tribes in Pennsylvania engaged in trade with Europeans, and the fur trade was a major motivation for the European colonization of North America. The fur trade also sparked wars among Native American tribes, including the Beaver Wars, which saw the Iroquois Confederacy rise in power. In the 17th century, the Dutch, Swedish, and British all competed for southeastern Pennsylvania, while the French expanded into parts of western Pennsylvania. In 1638, the Kingdom of Sweden, then one of the great powers in Europe, established the colony of New Sweden in the area of the present-day Mid-Atlantic states. The colony was established by Peter Minuit, the former governor of New Netherland, who established the fur trading colony over the objections of the Dutch. New Sweden extended into modern-day Pennsylvania, and was centered on the Delaware River with a capital at Fort Christina (near Wilmington, Delaware). In 1643, New Sweden Governor Johan Björnsson Printz established Fort Nya Gothenburg, the first European settlement in Pennsylvania, on Tinicum Island. Printz also built his own home, The Printzhof, on the island. In 1609, the Dutch Republic, in the midst of the Dutch Golden Age, commissioned Henry Hudson to explore North America. Shortly thereafter, the Dutch established the colony of New Netherland to profit from the North American fur trade. In 1655, during the Second Northern War, the Dutch under Peter Stuyvesant captured the New Sweden. Although Sweden never again controlled land in the area, several Swedish and Finnish colonists remained, and with their influence came America's first log cabins. The Kingdom of England had established the Colony of Virginia in 1607 and the adjacent Colony of Maryland in 1632. England also claimed the Delaware River watershed based on the explorations of John Cabot, John Smith, and Francis Drake. The English named the Delaware River for Thomas West, 3rd Baron De La Warr, the Governor of Virginia from 1610 until 1618. During the Second Anglo-Dutch War (1665–1667), the English took control of the Dutch (and former Swedish) holdings in North America. At the end of the Third Anglo-Dutch War, the 1674 Treaty of Westminster permanently confirmed England's control of the region. Following the voyages of Giovanni da Verrazzano and Jacques Cartier, the French established a permanent colony in New France in the 17th century to exploit the North American fur trade. 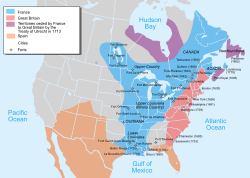 During the 16th, 17th, and 18th centuries, the French expanded New France across present day Eastern Canada into the Great Lakes region, and colonized the areas around the Mississippi River as well. New France expanded into western Pennsylvania by the 18th century, as the French built Fort Duquesne to defend the Ohio River valley. With the end of the Swedish and Dutch colonies, the French were the last rivals to the British for control of the region that would become Pennsylvania. France was often allied with Spain, the only other remaining European power with holdings in continental North America. Beginning in 1688 with King William's War (part of the Nine Years' War), France and England engaged in a series of wars for dominance over Northern America. The wars continued until the end of the French and Indian War in 1763, when France lost New France. William Penn, founder of Pennsylvania. Penn was a Quaker and the son of a prominent admiral. On March 4, 1681, Charles II of England granted the Province of Pennsylvania to William Penn to settle a debt of £16,000  (around £2,100,000 in 2008, adjusting for retail inflation)  that the king owed to Penn's father. Penn founded a proprietary colony that provided a place of religious freedom for Quakers. Charles named the colony Pennsylvania ("Penn's woods" in Latin), after the elder Penn, which the younger Penn found embarrassing, as he feared people would think he had named the colony after himself. Penn landed in North America in October, 1682, and founded the colonial capital, Philadelphia, that same year. The 1750 possessions of Britain (pink), France (blue), and Spain (orange). The French would lose their North American possessions to England after the French and Indian War. 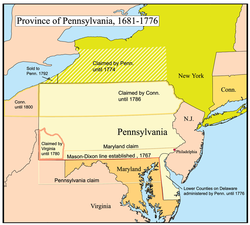 The western portions of Pennsylvania were among disputed territory between the colonial British and French during the French and Indian War (the North American component of the Seven Years' War). The French had established numerous fortified sites in Pennsylvania, including Fort Le Boeuf, Fort Presque Isle, Fort Machault, and the pivotal Fort Duquesne, located near the present site of Pittsburgh. Many Indian tribes were allied with the French because of their long trading history and opposition to the expansion of the British colonies. The conflict began near the present site of Uniontown, Pennsylvania when a company of Virginia militia under the command of George Washington ambushed a French force at the Battle of Jumonville Glen in 1754. Washington retreated to Fort Necessity and surrendered to a larger French force at the Battle of Fort Necessity. In 1755, the British sent Braddock Expedition to capture Fort Duquesne, but the expedition ended in failure after the British lost the Battle of the Monongahela near present-day Braddock, Pennsylvania. In 1758, the British sent the Forbes Expedition to capture Fort Duquesne. The French won the Battle of Fort Duquesne, but after the battle the outnumbered French force demolished Fort Duquesne and retreated from the area. Fighting in North America had mostly come to an end by 1760, but the war continued until the signing of the Treaty of Paris in 1763. Britain's victory in the war helped secure Pennsylvania's frontier, as the Ohio Country came under formal British control. Although New France was no more, the French would deal their British rivals a major blow in the American Revolution by aiding the rebel cause. The Thirteen Colonies and the Indian Reserve in 1775. Settlement of the Indian Reserve was prohibited by the English crown, which sparked resentment among Americans. Elections in 1776 turned the old assemblymen out of power. But the new constitution lacked a governor or upper legislative house to provide checks against popular movements. It also required test oaths, which kept the opposition from taking office. The constitution called for a unicameral legislature or Assembly. Executive authority rested in a Supreme Executive Council whose members were to be appointed by the assembly. In elections during 1776, radicals gained control of the Assembly. By early 1777, they selected an executive council, and Thomas Wharton, Jr. was named as the President of the Council. This constitution was never formally adopted, so government was on an ad-hoc basis until a new constitution could be written fourteen years later. In 1780, Pennsylvania passed a law that provided for the gradual abolition of slavery, making Pennsylvania the first state to pass an act to abolish slavery (although Vermont had also previously abolished slavery). Children born after that date to slave mothers were considered legally free, but they were bound in indentured servitude to the master of their mother until the age of 28. The last slave was recorded in the state in 1847. Six years after the adoption of the Articles of Confederation, delegates from across the country met again at the Philadelphia Convention to establish a new constitution. Pennsylvania ratified the U.S. Constitution on December 12, 1787, and was the second state to do so after Delaware. The Constitution took effect after eleven states had ratified the document in 1788, and George Washington was inaugurated as the first President of the United States on March 4, 1789. After the passage of the Residence Act, Philadelphia again served as the capital of the nation from 1790-1800, before the capital was permanently moved to Washington, D.C. Pennsylvania ratified a new state constitution in 1790; the constitution replaced the executive council with a governor and a bicameral legislature. Pennsylvania's borders took definitive shape in the decades before and after the Revolutionary War. The Mason–Dixon line established the borders between Pennsylvania and Maryland, and was later extended to serve as the border between Pennsylvania and Virginia (except for what is now West Virginia's northern panhandle). Although some settlers proposed the creation of the state of Westsylvania in the area that now contains Pittsburgh, Pennsylvania retained control of the region. The first Treaty of Fort Stanwix and the Treaty of Fort McIntosh  saw Native Americans relinquish claims on present-day southwestern Pennsylvania. The Treaty of Paris (1783) granted the United States independence, and also saw Great Britain give up its land claims in the neighboring Ohio Country, although most these lands ultimately became new states under the terms of the Northwest Ordinance of 1787. In the second Treaty of Fort Stanwix, Pennsylvania gained control of northwestern Pennsylvania from the Iroquois League. The New York–Pennsylvania border was established in 1787. Pennsylvania purchased the Erie Triangle from the federal government in 1792. In 1799, the Pennamite–Yankee War came to an end, as Pennsylvania kept control of the Wyoming Valley despite the presence of settlers from Connecticut. After the United States government granted land to Revolutionary War soldiers for military service, the Pennsylvania General Assembly passed a general land act on April 3, 1792. It authorized the sale and distribution of the large remaining tracts of land east and west of the Allegheny River in hopes of sparking development of the vast territory. The process was an uneven affair, prompting much speculation but little settlement. Most veteran soldiers sold their shares sight unseen under market value, and many investors were ultimately ruined. The East Allegheny district consisted of lands in Potter, McKean, Cameron, Elk, and Jefferson counties, at the time worthless tracts. West Allegheny district was made up of lands in Erie, Crawford, Warren, and Venango counties, relatively good investments at the time. Pennsylvania, one of the largest states in the country, always had the second most electoral votes from 1796 to 1960. From 1789 to 1880, the state only voted for two losing presidential candidates: Thomas Jefferson (in 1796) and Andrew Jackson (in the unusual 1824 election). 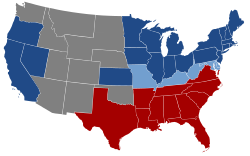 The Democratic-Republicans dominated the state for most of the First Party System, as the Federalists experienced little success in the state after the 1800 election. Pennsylvania generally supported Andrew Jackson and the Democratic Party in the Second Party System (1828–54), although the Whigs won several elections in the 1840s and 1850s. The Anti-Masonic Party was perhaps Pennsylvania's most successful third party, as it elected Pennsylvania's only third-party governor ( Joseph Ritner) and several congressmen in the 1830s. A locomotive in 1848. Pennsylvania became an important railroad center during the 19th century. Settlers continued to cross the Allegheny Mountains. Pennsylvanians built many new roads, and the National Road cut through Southwestern Pennsylvania. Pennsylvania also saw the construction of thousands of miles of rail, and the Pennsylvania Railroad became one of the largest railroads in the world. Pittsburgh grew into an important town West of the Alleghenies, although the Great Fire of Pittsburgh devastated the town in the 1840s. In 1834, Pennsylvania completed construction on the Main Line of Public Works, a railroad and canal system that stretched across southern Pennsylvania, connecting Philadelphia and Pittsburgh. In 1812, Harrisburg was named the capital of the state, providing a more central location than Philadelphia. Several Pennsylvania politicians gained national renown. Frederick Muhlenberg of Pennsylvania served as the nation's first House of Representatives. Albert Gallatin served as the Secretary of the Treasury from 1801–14. Democrat James Buchanan, the first and only President of the United States from Pennsylvania, took office in 1857 and served until 1861. Map of the USA and the CSA during the Civil War. Pennsylvania was a key member of the Union. The Gettysburg Campaign, culminating in the Battle of Gettysburg, a major turning point in the Civil War. Pennsylvania was the target of several raids by the Confederate States Army. J.E.B. Stuart made cavalry raids in 1862 and 1863; John Imboden raided in 1863 and John McCausland in 1864, when his troopers burned the city of Chambersburg. However, easily the most famous and important military engagement in Pennsylvania was the Battle of Gettysburg, which is considered by many historians as the major turning point of the American Civil War. The battle, called "the high water mark of the Confederacy," was a major union victory in Eastern theater of the war, and the Confederacy was generally on the defensive following the battle. Dead from this battle rest at Gettysburg National Cemetery, established at the site of Abraham Lincoln's Gettysburg Address. A number of smaller engagements were also fought in the state during the Gettysburg Campaign, including the battles of Hanover, Carlisle, Hunterstown, and the Fairfield. Pennsylvania's Thaddeus Stevens and William D. Kelley emerged as leading members of the Radical Republicans, a group of Republicans that advocated winning the war, abolishing slavery, and protecting the civil rights of African-Americans during Reconstruction. Pennsylvania generals who served in the war include George G. Meade, Winfield Scott Hancock, John Hartranft, and John F. Reynolds. Governor Andrew Curtin strongly supported the war and urged his fellow governors to do the same, while former Pennsylvania Senator Simon Cameron served as Secretary of War before his removal. Simon Cameron, Secretary of War and boss of the state Republican Party. Cameron founded a party machine that controlled Pennsylvania well into the 20th century. Hazleton coal miners in 1900. Coal mining was a major economic activity in Pennsylvania in the 19th and 20th centuries. Even before the Civil War, Pennsylvania had emerged as a center of scientific discovery, and the state, led by its two major urban centers, continued to be a major place of innovation. The state continued to innovate, as Pennsylvanians invented the first iron and steel t-rails, iron bridges, air brakes, switching signals, and drawn metal wires. Pennsylvanians also contributed to advances in aluminum production, radio, television, airplanes, and farm machinery. During this period, Pittsburgh emerged as an important center of industry and technological innovation, and George Westinghouse became one of the preeminent inventors of the United States. Philadelphia became one of the leading medical science centers in the nation, although it no longer rivaled New York City as a financial capital. Frederick Winslow Taylor pioneered the field of scientific management, becoming America's first "efficiency engineer." By 1910, Chicago had passed Philadelphia as the second most populous city in the United States, while Pittsburgh rose to the eighth spot after annexing Allegheny. Education continued to be a major issue in the state, and the state constitution of 1874 guaranteed an annual appropriation for education. School attendance became compulsory in 1895, and by 1903, school districts were required to either have their own high schools or pay for their residents to attend another high school. Two of Pennsylvania's largest public schools were founded in the mid-to-late 19th century. The Pennsylvania State University was founded in 1855, and in 1863 the school became Pennsylvania's land-grant university under the terms of the Morrill Land-Grant Acts. Temple University in Philadelphia was founded in 1884 by Russell Conwell, originally as a night school for working-class citizens. Other schools, such as Bucknell University, Carnegie Mellon University, Drexel University, Duquesne University, La Salle University, Lafayette College, Lehigh University, Saint Francis University, Saint Joseph's University, and Villanova University were also founded in the 19th and early 20th centuries. The Western University of Pennsylvania had been operating since 1787, but the school changed its name to the University of Pittsburgh in 1908. Additionally, the Carlisle Indian Industrial School was founded in 1879 as the flagship American Indian boarding school. A 1935 WPA poster. The WPA employed millions of Americans during the Great Depression. General George Marshall, Army Chief of Staff and key post-war figure. The 2012 presidential election result in Pennsylvania. The election is typical of 21st century elections in that the Democrat won several eastern counties and Allegheny County, while the Republican carried most other counties in the state. The state was hard-hit by the decline and restructuring of the steel industry and other heavy U.S. industries during the late 20th century. With job losses came heavy population losses, especially in Philadelphia and Pittsburgh. With the end of mining and the downturn of manufacturing, the state has turned to service industries. Pittsburgh's concentration of universities has enabled it to be a leader in technology and healthcare. Similarly, Philadelphia has a concentration of university expertise. Healthcare, retail, transportation, and tourism are some of the state's growing industries of the postindustrial era. As in the rest of the nation, most residential population growth has occurred in suburban rather than central city areas, although both major cities have had significant revitalization in their downtown areas. Pittsburgh lost its place among the top ten most populous cities in the United States after the 1940s, while Philadelphia is now the fifth largest city after New York, Los Angeles, Chicago, and Houston. Philadelphia anchors the sixth-largest metropolitan area in the country, while Pittsburgh is the center of the twenty-second largest metro area in the country. The growth of the Lehigh Valley has made it one of the seventy most populous metro areas in the country,  while Pennsylvania also has six other metro areas among the top 200 most populous American metro areas. Philadelphia forms part of the Northeast megalopolis and is associated with the Northeastern United States, while Pittsburgh is part of the Great Lakes Megalopolis and is often associated with the Midwestern United States and the Rust Belt. ^ "Paleoindian Period – 16,000 to 10,000 years ago". Pennsylvania Historical and Museum Commission. Retrieved 8 December 2014. ^ a b c d "Pennsylvania on the Eve of Colonization". Pennsylvania Historical and Museum Commission. Retrieved 30 November 2014. ^ "Late Woodland Period in the Susquehanna and Delaware River Valleys". Pennsylvania Historical and Museum Commission. Retrieved 8 December 2014. ^ Bloemker, James D. "An Overview of Historical Archaeology in West Virginia" 1988. ^ Froman, Francis & Keye, Alfred J. "English-Cayuga/Cayuga-English Dictionary" 2014. ^ Hale, Horatio "The Iroquois Book of Rites" 1884. ^ "On the Susquehannocks: Natives having used Baltimore County as hunting grounds - The Historical Society of Baltimore County". www.HSOBC.org. Retrieved August 17, 2017. ^ "EARLY INDIAN MIGRATION IN OHIO". GenealogyTrails.com. Retrieved August 17, 2017. ^ Garrad, Charles "Petun & the Petuns"
^ "Brief History of the Lenape". LenapeDelawareHistory.net. Retrieved August 17, 2017. ^ Snow, Dean R. (1996). "Mohawk demography and the effects of exogenous epidemics on American Indian populations". Journal of Anthropological Archaeology. 15: 160–182. doi: 10.1006/jaar.1996.0006. ^ a b c d "Contact Period (1500-1763)". Pennsylvania Historical and Museum Commission. ^ mapsofpa.com "16th Century Pennsylvania Maps"
^ Pennsylvania Society of Colonial Governors, ed. (1916). "Samuel Carpenter". Pennsylvania Society of Colonial Governors, Volume 1. pp. 180–181. ^ "Measuring Worth". Archived from the original on 2011-07-14. Retrieved 2010-07-31. ^ a b "The Quaker Province: 1681-1776". Pennsylvania Historical and Museum Commission. Retrieved 8 December 2014. ^ a b "The American Revolution". Explore PA History. WITF. Retrieved 27 November 2014. ^ Parkman, Francis. Montcalm and Wolfe (1884). Reprinted in France and England in North America, Volume 2, New York: The Library of America, 1983. pp. 1076–1083. ^ a b "Chapter 4: Dispossession, Dispersal, and Persistence". Explore PA History.com. Retrieved 2 December 2014. ^ Clinton Rossiter, Seedtime of the Republic: the origin of the American tradition of political liberty (1953) p. 106. ^ Middlekauff, Robert. The Glorious Cause: The American Revolution, 1763–1789 (1985), p. 550. ^ "Constitution of Vermont (1777)". Chapter I, Article I: State of Vermont. 1777. Retrieved June 7, 2014. ^ Wood, Gordon S. (2009). Empire of Liberty. Oxford University Press. pp. 134–139. ^ "From Independence to the Civil War: 1776–1861". Pennsylvania Historical and Museum Commission. Retrieved 1 December 2014. ^ a b "Crossing the Alleghenies". Explore PA History. WITF. Retrieved 27 November 2014. ^ "Agriculture and Rural Life". Retrieved 27 November 2014. ^ "Chapter Two: Staying the "Battle Axe of Ignorance": The Rise of Public Education". Explore Pa History.com. WITF. Retrieved 27 November 2014. ^ "Chapter One: Pennsylvania Democrats". Explore PAHistory.com. WITF. Retrieved 27 November 2014. ^ a b c d e f g h i j k l m n o p "The Era of Industrial Ascendancy: 1861–1945". Pennsylvania Historical and Museum Commission. Retrieved 1 December 2014. ^ a b c Morgan, Alfred L. (April 1978). "The Significance of "Pennsylvania s 1938 Qubernatorial £lection". 102 (2): 184–210. Retrieved 26 November 2014. ^ a b "Chapter One: 1. Pennsylvania's Bosses and Political Machines". Explore PA History.com. WITF. Retrieved 27 November 2014. ^ "Chapter Four: From the Progressive Era to the Great Depression". Explore PAHistory.com. WITF. Retrieved 27 November 2014. ^ a b "Chapter 2: Pennsylvania Under the Reign of Big Business". Explore PAHistory.com. WITF. Retrieved 27 November 2014. ^ "Overview: Labor's Struggle to Organize". Explore PAHistory.com. WITF. Retrieved 27 November 2014. ^ "Overview: Science and Invention". Explore PAHistory.com. WITF. Retrieved 27 November 2014. ^ "Governor George Howard Earle III". State historic preservation office. Pennsylvania Historical and Museum Commission. Retrieved 26 November 2014. ^ "George H. Earle III Historical Marker". Explore PA History.com. WITF. Retrieved 26 November 2014. ^ "Maturity: 1945-2011". Pennsylvania Historical and Museum Commission. Retrieved 1 December 2014. ^ Cohen, Micah. "In Pennsylvania, the Democratic Lean Is Slight, but Durable". Retrieved 1 December 2014. ^ Kraus, Scott. "No end in sight to Valley's population growth". Retrieved 1 December 2014. Klein, Philip S and Ari Hoogenboom. A History of Pennsylvania (1973). Barr, Daniel P. A Colony Sprung from Hell: Pittsburgh and the Struggle for Authority on the Western Pennsylvania Frontier, 1744-1794 (Kent State University Press, 2014); 334 pp. Blatz, Perry. Democratic Miners: Work and Labor Relations in the Anthracite Coal Industry, 1875-1925. Albany: SUNY Press, 1994. Binder, Frederick Moore. Coal Age Empire: Pennsylvania Coal and Its Utilization to 1860. Harrisburg: Pennsylvania Historical and Museum Commission, 1974. Churella, Albert J. (2013). The Pennsylvania Railroad: Volume I, Building an Empire, 1846-1917. Philadelphia: University of Pennsylvania Press. ISBN 978-0-8122-4348-2. OCLC 759594295. Davies, Edward J., II. The Anthracite Aristocracy: Leadership and Social Change in the Hard Coal Regions of Northeastern Pennsylvania, 1800–1930 (1985). Dublin, Thomas, and Walter Licht, The Face of Decline: The Pennsylvania Anthracite Region in the Twentieth Century Cornell University Press, (2005). ISBN 0-8014-8473-1. Powell, H. Benjamin. Philadelphia's First Fuel Crisis. Jacob Cist and the Developing Market for Pennsylvania Anthracite. The Pennsylvania State University Press, 1978. Warren, Kenneth. Triumphant Capitalism: Henry Clay Frick and the Industrial Transformation of America (1996). Casey, Robert P. Fighting for Life: The Story of a Courageous Pro-Life Democrat Whose Own Brush with Death Made Medical History. Dallas, Texas: Word Publishing (1996). Autobiography. Hardcover: ISBN 0-8499-1224-5, ISBN 978-0-8499-1224-5. Boston Public Library, Map Center. Maps of Pennsylvania, various dates.